Pallet racking is a type of storage system used to store pallet loads or material and product. This system is a primary feature of any distribution, storage, or material handling operation. 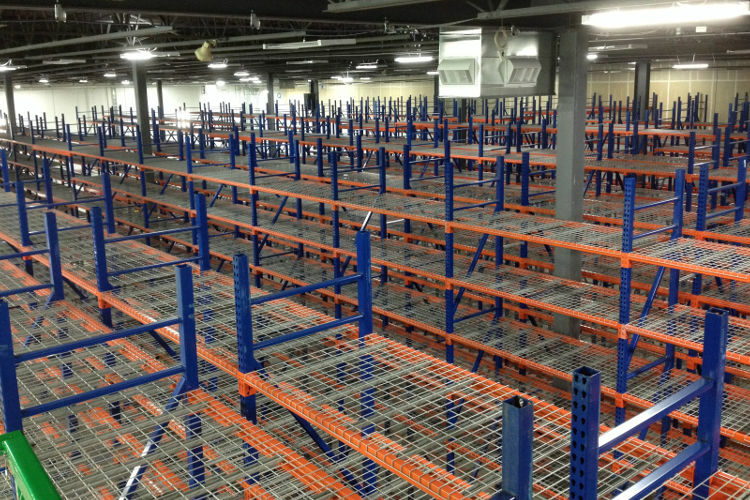 Pallet racking systems allow for quick access to stored materials, maximizing facility space while simplifying inventory systems. The addition of wire decking to the storage system in a warehouse allows managers to be both safe and efficient. Pallet racks feature vertical upright frames and horizontal load beams designed to handle the heavy loads being stored. Pallet supports, wood, composite material, sheet metal or wire decking are placed on or between the load beams. Doing so provides a larger surface area for the loads being stored. Wire decking is a popular accessory in pallet racking and has been proven to be far superior to wood decking due to its strength, safety features and cleanliness. Wire decking is constructed with heavy gauge wire that is welded into wide grid deck panels. Channel supports are added to form a strong and rigid wire deck structure. A high-quality and long-lasting powder coat finish is added to protect the wire deck from corrosion. Compared to the traditional wood boards, wire decks offer a far stronger product that increases safety and efficiency at a much lower cost, and eliminates the dust caused by wood for a much cleaner facility. Wire decking is a popular option particularly for industries looking to ensure their storage systems are safe, secure, and stable. In fact, wire mesh decking is a top choice that will increase the safety and efficiency of any warehouse application. Due to its safety features, wire decking has now become mandated in facilities throughout the United States. Wire decking meets fire safety codes at the local level and meets OSHA standards as well. Wire mesh decking is designed to eliminate safety issues and provide a cost-effective solution. Industries looking to improve fire safety in their warehouse should consider implementing wire-decking systems. 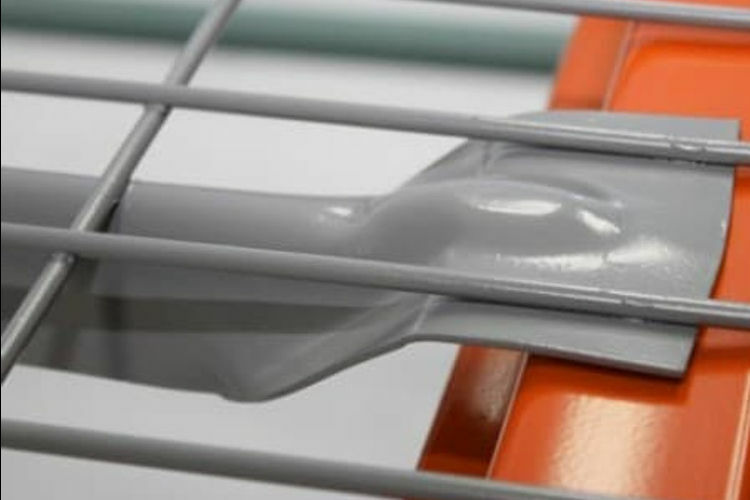 This is because wire decking allows water to flow from one shelf to another due to its open-mesh design. If a fire was to suddenly break out, the water could reach the system levels below because wire decks allow for sprinkler penetration. In comparison, shelving surfaces made from particleboard or plywood would fuel the fire. Because these shelving surfaces are made of solid, flammable material, water released from overhead sprinkler systems would be blocked and unable to reach the stored product units below. Water would not be able to run down to each storage system level. Because of this, the use of wire mesh decking is often paired with pallet racking set ups. Wire decking increases the effectiveness of sprinkler systems and, in turn, lessens the damage to the facility and inventory stored on the pallet racks. In addition to providing fire safety features, wire decking offers many other benefits. Wire decking is designed to prevent the stored material from falling through the pallet rack structure, which provides an additional safety measure in case the pallet load is not set properly on the load beams. In addition, most wire decking units are designed with support channels. These support channels increase the overall strength and weight-holding capacity of the wire decking to provide additional support for the pallet loads being stored. More specifically, wire decking provides higher weight capacities than wood shelving units. In fact, wood shelving units are more labor intensive, create a fire hazard, and collect dust and debris. In comparison, wire decks do not allow for dirt or dust build up, which makes this storage system relatively maintenance free and a strong alternative to wood decking. To meet the individual needs of your warehouse and current storage system, wire mesh decking is available in several different styles, including: Flush Fit, Flared Channel, Step Channel, Inside Waterfall, and Inverted. With custom wire mesh deck designs, your warehouse can have versatility and functionality to meet your specific needs. You will find a description about each style’s design, features, and benefits below. The flush fit wire mesh decks are designed with a flat flush edge where the end wire comes in contact with the inside of the step beam. The face of the beam remains clear for bar-code labeling, making it a popular choice for lower level hand stacking and order picking applications. The flush deck doesn’t have edges that could catch on an employee’s hands, making it a safe choice. 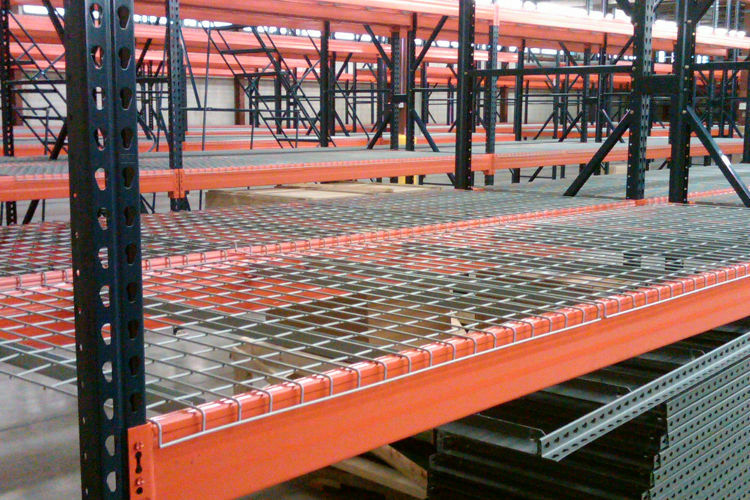 Step channel wire mesh decks are designed for standard pallet rack step beams. They feature a waterfall design with u-channel supports. Their channels are designed to set down into 1-5/8” standard step beams. Wire decking with step channel supports is the most popular wire deck choice because it gives the greatest support at the lowest price. The term “waterfall” refers to the end(s) of the deck that hang just below the deck’s surface. Waterfalls provide additional protection to wire decks by making them more resistant to coming off of the pallet rack unexpectedly. The inside waterfall wire mesh decks are designed such that the face is unobstructed because the wire is hidden inside the step. The inverted wire mesh decks are designed such that they are turned upside down, providing a lip to prevent product from falling off a shelf. The inverted wire decking fits on step or box style pallet rack beams. An advantage to the inverted channel design is that debris cannot accumulate inside of the support channel. Each of these wire-decking styles is equipped to handle cartons and multiple pallet sizes. Wire decking is easy to install. It is simply placed on top of pallet racking beams and locked into place. Whether loading full pallets or hand stacking small cartons, these super strong wire decks give your warehouse durability and versatility for changing applications. In order to choose the right wire decking for your company’s warehouse, you will need to know the amount of weight the shelving units will need to support. Knowing this figure will allow you to determine which gauge wire decking is best for your company’s specific needs. 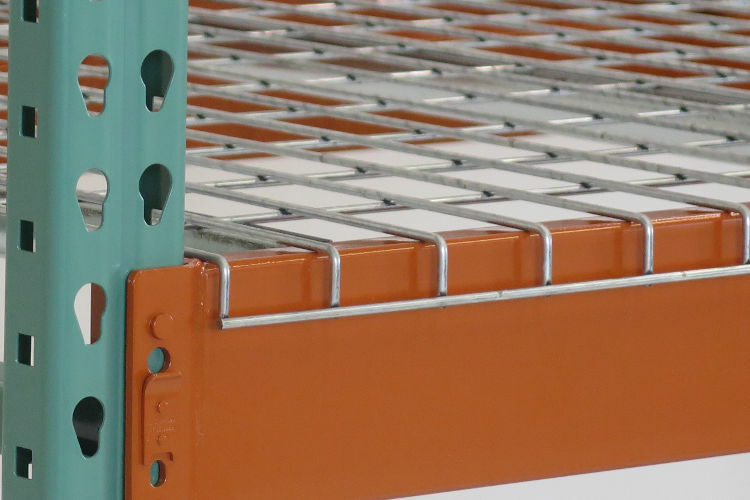 If you believe wire decking should be a part of your pallet racking set up, be sure to purchase high-quality units from a renowned materials handling manufacturing company. You’ll want to locate a supplier that can provide you with custom sizes that meet your specific warehouse needs. Companies that specialize in wire decking will be able to assist in the installation process as well. Applied Handling NW can help you with your storage systems needs. We will design a material handling system for your warehouse. After determining the weight capacity needed, we will recommend the wire decking style that will be best for your pallet racking system and offer a complete pallet rack safety inspection. Contact us today to get the process started!